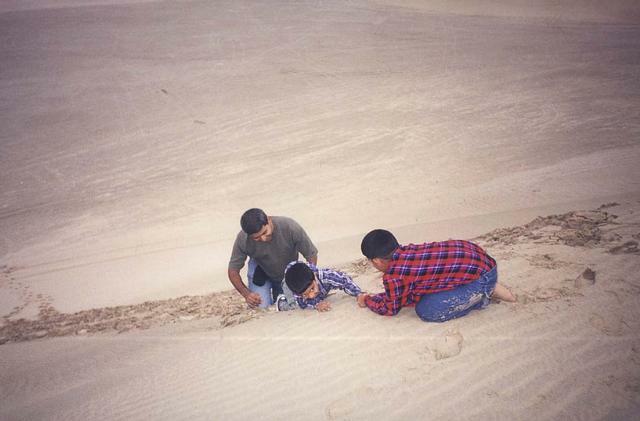 Hitting the dunes, and falling in love with it… a snapshot from 1999, with friends who soon after moved to boring Dubai. “Where are you from” and “How long have you been here” are probably the two most asked questions in Qatar. No I am not, and I survived really well, thank you for asking. Here are my 16 thoughts and memories on life in Qatar. 1. A lot has changed in 15 years, a lot hasn’t. When I landed here for the first time, the bleak beige I could see from the plane made me tear up. That beige is now decked out in bling. No tears either. 2. There was never a ‘culture shock’ for me. I come from a country with similar values and mores. Be it intrusive dress codes, or that social don’ts outnumbered the dos. What I had to get used to was calling this the Middle East. This is West Asia, folks. Get over the colonial hangover. 3. And isn’t it time we stopped calling stationery shops libraries. I can still taste the disappointment from all those years ago, running from one ‘library’ to another, only to stare at racks of notebooks, pens and charts. While at it, can we have some real public libraries. 4. Fifteen years ago, you didn’t need to learn Arabic to live and work here. You still don’t. A big part of me wishes this would change. A small part of me that failed to learn conversational Arabic after several attempts, is glad. Qatar desperately needs a good conversational Arabic programme. 5. Where is home? Long ago, I thought Chennai was. It isn’t quite now. Neither is Qatar. And this has nothing to do with the place, but everything to do with what I think of as home. It’s a place that’s populated by people I love and care for. So, I am tempted to say What’s App or Facebook. 6. But for my children, this is home. These are two fairly well-travelled children, and to hear them speak of Qatar is funny, and sometimes a little embarrassing. They compete with narrations from cousins and friends from Dubai, Toronto, Singapore, Bangalore, Colombo… Their fabulous Qatar is a match to all those places. The dunes, beaches, MIA park, Katara, Karak & Chapathi, Mathaf workshops, Mangroves, camping and Inland Sea. 7. Which is why I challenge anyone who tells me there’s not much to do in Qatar. My children have taught me well. There’s plenty to do, and our guests who visit us go back pleasantly surprised. Just put a lid on the comparisons, and move your derriere off the bar stool or your snout off the shisha pipe. 8. However, a pet peeve is that not everyone we love can visit us, even if my husband and I have 32 residency stamps between us, our parents are too Asian and too old to be allowed easy entry. 9. That probably is the only personal ‘bad’ that I attribute to the country. There’s not anything else I perceive as a Qatar-specific problem. Most are problems that many other countries suffer from too. And we are not talking about the oppressed outside of Qatar. So no, not all Qataris are lazy and stupid. Some are. Some Indians, Brits, Egyptians, *insert the nationality of your choice* are lazy and stupid too. It’s a human trait, not a nationality-specific one. 12. And no, not all expatriates are here only for the tax-free salaries, though for many of us, including yours truly, it’s an attraction. Then over a period of time, one starts investing in the country and community, and it becomes more than just about the tax-free moolah. You find a job you enjoy, a person you fall in love with, or a karak addiction you can’t shake off. 13. Qatar at its best? The 2006 Asian Games when residents regardless of nationality volunteered in the thousands to make it a success. 14. Qatar at its worst? Child jockeys. Brutalised, scarred… the stuff nightmares are made of. 15. By the way, when I complain about Qatar, you have no business asking me to leave if I don’t like it. It’s not your call to make (unless you have wasta at the MoI). After 15 years, my complaints are not about ‘you people’, but about ‘we people’. 16. How much longer do I plan on staying? We came here just for a year, and refused to invest in proper furniture (heil Souq Haraj!) the first 18 months, and didn’t buy a car till 2004; because you know, we didn’t plan on staying long. Now our furniture is of better pedigree, and there are two cars in the garage. But the plan stays the same. PS: I was asked to do a retrospective by an online news site on the ’15 going on 16 years’ in Qatar. But the too-bloggy post was not quite a fit. So Ummon hosts it instead.